Creating new and unique content on a regular basis is a necessity if you have a blog or website where people often visit to receive more information or get the latest news about a specific niche. One of the biggest problems for the website owner is to constantly generate new articles that will inspire and motivate their visitors to take action. Everyone has information inside of them that can be monetized however not everybody is aware of it. For instance if you know how to restore old vehicles you could write a series of articles about it and sell it as an ebook on Amazon. The problem most people have is how to write an informational article. If it’s not done correctly it won’t get accepted or published. Writing and syndicating articles on a consistent basis takes time and commitment. Most website owners view content development as a way to increase search engine rankings but may not think how their articles can make money. From January 1st, 2010 to April 10, 2010 I accepted the challenge of writing 100 articles in 100 days. Some times I thought I wouldn’t make it because I became very busy with tasks related to my web design business and got behind in my writing. Because I had made a commitment to myself and publicly to my friends I pushed on. This meant I sometimes had to write 5 articles each day to catch up. If you want to generate traffic to your website from the search engines you need optimize your web pages and build links to them. The more incoming links you get to those pages the higher your rankings will be. Many site owners fail to put a regular link building plan in place. They may have achieved good rankings initially with a a few incoming links however over time their rankings dropped (and so did their traffic) as competing websites outranked them. One of the easiest and fastest ways to build links is through writing and publishing articles. The more articles you write and distribute over the Net the more links you’ll acquire. Every person has their own unique style of writing that will appeal to a segment of readers. 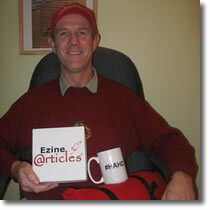 Ezine publishers and site owners are constantly looking for unique content to place in their ezines or on their websites. Submit your content to the top article directories to make it easy for publishers and site owners to find your articles. For example one article could potentially generate 100s of links to your website if it was used in an ezine of 10,000 subscribers or bookmarked by readers using bookmarking sites such as stumbleupon, digg, delicious, etc. Most article directories allow 2 links in the resource box at the end of the article. One should be anchor text (hyperlinked text), the other your full website address. The anchor text should contain your main keyword as search engines give more weight to links that include keywords related to your site. The full URL should also be included in case someone copies and pastes your article (from the article directory) into their ezine or web page. The anchor text won’t appear but the full URL will remain intact. When publishing the article on your website or blog find related articles or blog posts (within your site) then link them to your article using the article title as your anchor text. The best internal links are ones contained within your content (where the surrounding content relates to the link) . RSS (really simple syndication) allows your readers to easily be notified when a new article is added to your website. If your blog or website was built with WordPress software then it already has RSS built into it. Every time you add new content the software automatically alerts the search engines. Search engines spider and index your content based on keywords. Before writing each article research the keywords people use to find information on the Web. Make sure these keywords receive a good number of searches each month. Weave these keywords into the title, article body and resource box of each article. This increases the chances of your article receiving good rankings in the search engines. Blog owners are constantly looking for new content to maintain their visitor’s interest. Offer a to be a guest writer for a blog that compliments your own site and receives lots of traffic. This will generate powerful incoming links to your own website. If you implement these link building strategies on a regular basis you’ll see your rankings and traffic steadily increase. If you’re serious about marketing your online business consider accepting the challenge of writing 100 articles in 100 days. Ezinearticles is offering this challenge to anyone between Friday, January 1st 12:01AM CST-USA and Saturday, April 10th 11:59PM CST-USA. Each article must be at least 400 words in length. They ran a similar challenge from August-November in 2009 where I received a prize for being within the first 100 people to complete the challenge. It wasn’t easy because it required the discipline to write one article every day (or several articles in one day when I fell behind) however the benefits were tremendous. Including 2 links in the resource box at the end of your article builds backlinks to your own web site. Make sure one link uses anchor text (textual link) that includes your main keyword and the other should be your full web site address. 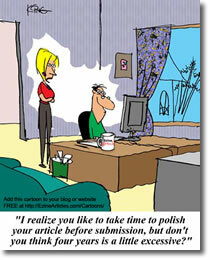 Writing and submitting 100 articles will produce lots of backlinks in a short time. Creating content that targets your main keywords will steadily increase the rankings of your web site. Weave your keywords into the title, article body and anchor text of each article you submit. At the end of 100 days your website will have moved to the top of the search engines depending on the competitiveness of your keywords. Traffic generated by submitting articles to ezinearticles and my web design discussion blog indirectly resulted in boosting newsletter subscribers. If I had sent visitors to directly to a squeeze page where people sign up for my newsletter, the number of subscribers would have been greater. When readers visit your web site many times through reading your articles they quickly become familiar with what services or products you’re offering. You are building your brand within their minds. A high quality article is far more effective than an ad because you help your customer make an informed decision by reading its content. Your article will also keep working for you as long as it remains on the Net. An ad is short-lived unless you pay keep paying to have it displayed. An article only costs you the time to write and submit it. The quality and speed of your writing improves as you create more content on a regular basis. As you develop your own writing style you attract and retain more readers. I recommend taking up the challenge of writing 100 articles in 100 days so you can reap all the 7 benefits mentioned above. Leave a comment below if you decide to take up the challenge. If you’re already writing content for your blog or web site, consider adding an additional income stream by writing articles for profit. This can be achieved without too much effort and also improve your writing skills. Take the articles you’ve already written (or modify them) and weave them together to create short reports or an ebook. A report need only be 10-15 pages long. If you have 15 related articles you already have enough to sell your report. Sell it for $7-$10.00. An ebook is more substantial than a report and will sell for more. For instance a 100 page ebook could sell for $47.00 or more. To make it easier to create your ebook split the content into chapters. Use the articles you’ve already written for chapter content. Create a series of email messages from your articles then load them into an autoresponder. Schedule each message ot be sent every few days. Within each message promote your own product or an affiliate product. By constantly reminding your visitor about the product in your follow-up messages you have a greater potential to make a sale. Take the articles you’ve already written and record them by reading into your recorder. Play the audio for your webinar or even sell it as a product. Charge visitors to attend your webinar or if you offer it for free channel direct them to your products. Create a video of your article by reading it on camera or making a slide show. Use the videos for upselling a report or ebook or even as a stand alone product. These are Google ads placed within your web site content. When someone clicks on them you make a few cents. If your web site or blog has 100s of pages containing adsense ads your earnings will increase dramatically. The beauty of this system is that it’s free and easy to set up and enables you to earn a passive income. Web site owners constantly need unique content to attract visitors. A ghostwriter writes the article for you without receiving recognition for it apart from making money. For instance you could charge $300.00 for a well researched, well written article. A newsletter is a great vehicle for making long term and short term money. A the end of each article in your newsletter promote your products. Alternatively offer advertisers paid ads in your newsletter as long as they relate to your content. Your newsletter builds long term relationships with your subscribers. People usually buy from people they know and trust. This provides an opportunity to sell your products and services to your subscribers over and over again as long as they remain subscribed. 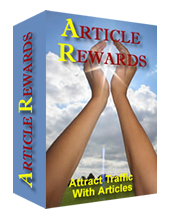 Constantly adding new articles to your web site increases your traffic. For instance an article optimized for the search engines may gain a first page ranking. Most folks only visit the first page to get the information they seek. If the web page containing your article maintains it’s high rankings, you’ll generate ongoing sales. Sites such as ehow and associatedcontent will pay you to write articles for them. The amount of money you make depends on the quantity and quality of the articles. If your web site or blog contains many high ranked articles or gets 1000s of visitors every day you’ll probably get offers from advertisers to place an ad or link on your web site. They will pay you for the traffic their ad receives. Alternatively you can sign up for services that will pay you to place their ads on your site. It’s a great way to earn a passive income without doing anything except inserting the ad and collecting your money. A well written article will attract more visitors than one hastily put together. It will also create a viral effect because good content gets quickly distributed around the Net by people publishing, linking and/or bookmarking it. Don’t just create a copy of the original article by changing the words or sentences around. It will read the same. For the content to be unique it needs to stand on its own. The original and rewritten content should not be recognized as the same article. Determine what your article will be used for and how many versions you need. For example publish the original article to your web site, blog or article directory. The purpose of your second (rewritten) article is to use it as a guest article on a high traffic web site such as an online magazine, ezine or blog. Set a time limit and just start writing content so your creative ideas freely flow from your mind. Don’t worry about correcting the spelling or grammar mistakes until you’ve completed the article. After letting it sit for a few hours or a day review what you’ve written before to make sure it is free of errors and ready for publication. Rewrite each paragraph by using alternative keywords and altering the sentence structure. Use the thesaurus to find synonyms for words you used in the first article. Redo the resource box by changing the call to action and using different anchor text. Sometimes it’s hard to rewrite the same article and not duplicate what you’ve already written. 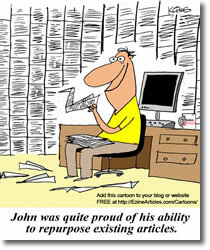 To avoid this write a new article from a different perspective using alternative keywords. They will spark new ideas. News articles captivate readers by beginning with a story. Do the same for your article but include some points they can act upon. People love checklists because they’re easy to read. Create a checklist of points from your original article. Visit forums and blogs to read what questions are being the asked the most in your niche then answer them in your content. Link your original article to the rewritten one(s) to improve its link popularity and search engine rankings. Don’t link to an article that says the same thing in different words. It will upset your readers. Instead only link to unique articles that compliment each other. by reading my review of Article Architect.